Grease had it so right! Our Summer Lovin' gallery was a total blast and it all happened so fast. August has somehow melted away but before we go, we need to take one last look back at our beautiful gallery and its lovely layouts! This month our gallery featured 11 single photo layouts, 14 multiple photo layouts, and 1 minialbum. If you copied each layout, you would have scrapbooked 86 photo and told no fewer than 25 stories. This month brought lots of geometric shapes, brought to you by misting, cutting, and silhouetting. There were also a handful of negative shapes, with color peeking in from behind. Color was ever present, with nary a black and white photo to be found! Instagram continues to trend with phone photos giving our digital slr's a run for their money! First up, 26 journaling ideas for your summertime pages. Kathy - do you cheat on your summer foods during the remainder of the year? Christa - soccer moms unite! tell what you do for your children! Next, 26 photo ideas for your summertime pages. Celeste - goggle shots rock! Teka - shoot down - feet and shoes! Lastly, 26 bits of design inspiration. That's it! 78 ideas to help keep your pages coming! No ruts allowed!! As a thank you for the time you have spent with us this month, Marnie created a printable for you to help you with your very own Summer Lovin' pages. You may download it here! Thank you for stopping! We would love to see your inspired pages! Hello! Kathy Martin here with another dose of Summertime Dailies. Have you noticed the days getting a little shorter as summertime winds down? Long daylight hours are one of the things I love most about summer and the time it affords me to enjoy my favorite hobbies like reading, cooking, gardening and antiquing. Last week our family enjoyed a little rest and relaxation at the beach and I noticed that I'm not the only one who enjoys a good read while on vacation. I also enjoy spending little time gardening and in the kitchen cooking, although during hot summer days the recipes I try are often salads with homemade dressings and fruit smoothies. Hobbies are an important part of documenting our memories so I thought I'd share some page ideas that incorporate some of my favorite pastimes. So, other than scrapbooking, what are your favorite ways to spend a lazy summer afternoon? Hello again everyone! Summer is just winding down over here in France (school doesn't start until the first week of September). I hope you have all had a great summer where ever you are! Today I want to talk a bit about my love of type. I think it is a love that is shared by many of my WCS team mates, and no doubt by many of you. I tend to consider type as part of my page design when I am creating a layout, and I love nothing better than mixing different fonts. My favourite way of adding my titles, and even journaling is letter stickers. 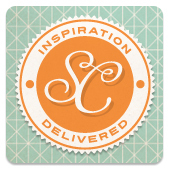 Any scrapbooking kits that contain at least two sets of letter stickers gets my vote! Here are some ways that you can play with type on your pages. I used two different sizes of letter stickers for the title here, the larger red text emphasises the words "red footed" making them pop off the page. In addition I cut out a portion of a sheet of patterned paper that repeated the alphabet over and over, using a piece starting with the letter K for Kieran. This page was inspired by a poster that I saw online. That phrase just matched this photo perfectly! I used a bunch of different letter stickers to convey a fun feel, and added an addition detail with the strip of text paper below the photo. So go ahead! Go grab that letter sticker stash (you know you have one!) and have some fun playing with type! Hi there! I am back with my final Summertime blog post! I dug out a project from the archives this time. Some of you might have seen it on my blog in 2011, but I think it is still my easiest minibook I have made and wanted to share the idea again. Now, bear with me when I try to explain what sort of page protector I have used. I have used one with 6 pockets. Let´s see a photo of it. OK, this mean I can use 6 6x4 photos and use the smaller pockets for journaling or embellishments. I have used polaroid square photos for my project. These two pictures show the front and back of the pageprotector when laid flat. Then I folded the page protector like an accordion and I can easily flip the pages. As you can see this mini is more about the photos than words. I used the smaller pockets for patterned papers and small embellishments. When I first made this I used it as a class project for tweens that are not that into scrapbooking and it worked supergood as a beginner project! Maybe this is something you can use at a birthday party or another event with kids or beginner scrabookers?!! Have fun! And I hope that the end of summer treats you well!